American Horror Story is hardly what I'd consider to be good television or even scary to any true extent. As we've seen with each self-contained season, it's really just a place for Ryan Murphy and Brad Falchuk to play around with stories and see how crazy they can make things. Like other Murphy-Falchuk productions, this means a lot of crazy plot twists and a lot of instances when the show seems to jump the shark as a matter of practice. American Horror Story: Coven is the third season in the series and perhaps one of the craziest ones yet. And this is considering that the previous season already featured a strange mix of demonic possession and aliens while at a mental institution. 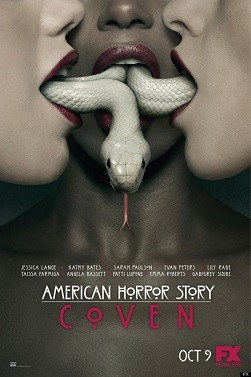 As the title implies, this season was all about witches, and it feels like the production team decided to make this the gayest season of AHS yet. And given the casting choices and many of the plot elements, I suppose they managed to achieve this particular "goal" with flying colors. Synopsis: American Horror Story: Coven is the third season of the American Horror Story series created by Ryan Murphy and Brad Falchuk. This story takes place in 2013 New Orleans and broadcast of pay-TV channel FX. The story centers around Miss Robichaux's Academy, a boarding school in New Orleans that is actually a school for young witches. The school is run by headmistress Cordelia Foxx (Sarah Paulson) who seems drastically different compared to her mother Fiona Goode (Jessica Lange). Fiona is also the "Supreme" of this coven, although she has been away for some time now. But as she feels her powers beginning to fade, she returns to the school in order to find away to maintain her powers a while longer. We also meet Zoe Benson (Taissa Farmiga), a young girl who has just discovered her own abilities in a most tragic fashion. There she meets the select students already at the Academy - Madison (Emma Roberts), a former child actress with telekinesis, Queenie (Gabourey Sidibe), who is some sort of a human voodoo doll, and Nan (Jamie Brewer), a clairvoyant who can also hear the thoughts of others. As the girls come into their own, it is also discovered that the Academy, and ultimately the Coven, is under attack. And Fiona's return may be well-timed as the witches learn to band together. The synopsis that I wrote above makes this seem all noble with this little band of witches fighting witch hunters and even a rival voodoo priestess. But really it's something like Mean Girls on steroids with everyone being catty to everyone else pretty much all the time. It's rare to have a perfectly nice character for any length of time since they're constantly clawing at one another. It's fitting that many have remarked the show practices bitchcraft more than actual witchcraft. To be fair, the core concept behind their notion of the magic of these witches is interesting enough. Each witch seems to be like a comic book mutant with one special ability. But the Supreme is able to manifest the Seven Wonders, representing seven different abilities that witches can have. And as one Supreme weakens, this represents the rise of a new Supreme as well. And naturally this is a significant part of the overall narrative as Fiona realizes this truth and decides what to do to preserve her own place in the world. The primary cast includes quite a number notable female figures. We were just getting started with Jessica Lange since we also have Angela Bassett as the voodoo priestess Marie Laveau, Kathy Bates as the immortal Delphine LaLaurie and even Patti LuPone as the religious next-door neighbor. The show has so many moving pieces that it gets a little dizzying trying to keep up. But things seem to boil down to crazy one-liners and scenes. How much did they have to pay Angela Bassett to say lines like "You bring us two ounces of your husband's baby gravy in a Mason jar." after all. Thing get really crazy with additional characters like Misty Day (Lily Rabe), who seems to have the power to raise dead, and then you have the some ghost of a murderer only known as the Axeman (Danny Huston). And I forgot to mention Fiona's creepy butler, the hunched Spalding (Denis O'Hare). I know he was a bit more of a visual piece, but some of the things that he ends up doing are pretty far out. American Horror Story: Coven may not have been the most coherent overall story for a mini-series, but it was certainly entertaining. And in that regard I suppose the show still worked out, even if as more of a guilty pleasure. So the season rates a surprisingly good 4 witches verbally sparring with one another out of a possible 5.